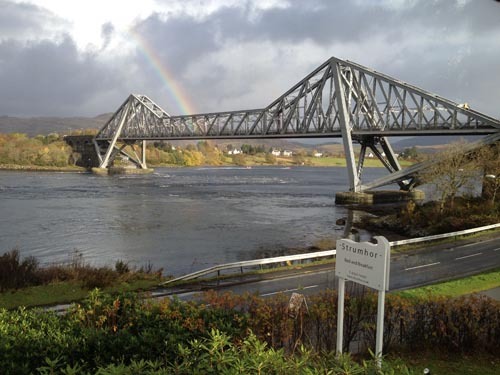 By the time that we arrived in Oban, Scotland there was the kind of wind that you can lean into and not fall over. Huge waves covered in white caps rolled over the sea, and sharp hail moved through the air in a sideways motion, piling up in corners and flowerbeds. 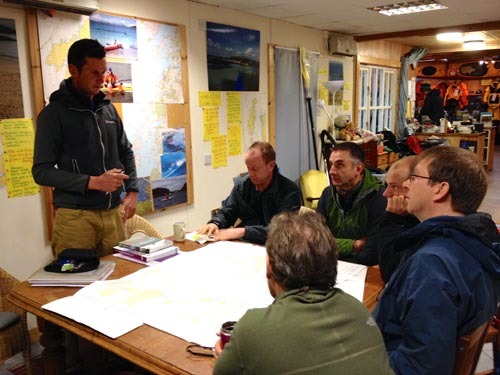 We were there for the 7th UK Storm Gathering, an open water symposium focused on skill building in challenging conditions. 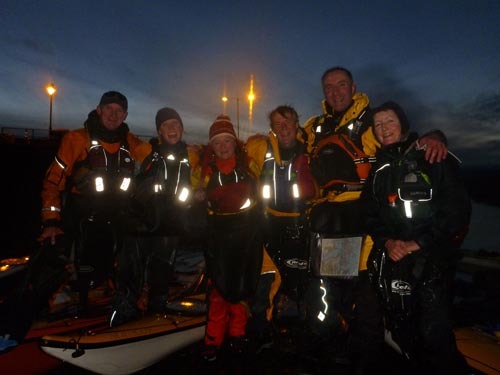 This year’s event was put together by Mark, and myself of Greenland or Bust, and Nick Cunliffe and Matt Giblin of Kayak Essentials. Our immediate thought upon arrival was that if the brunt of the storm came before the event started, then maybe things would settle and become slightly mellower for the following days. We wanted a storm, but this was a little out of control. 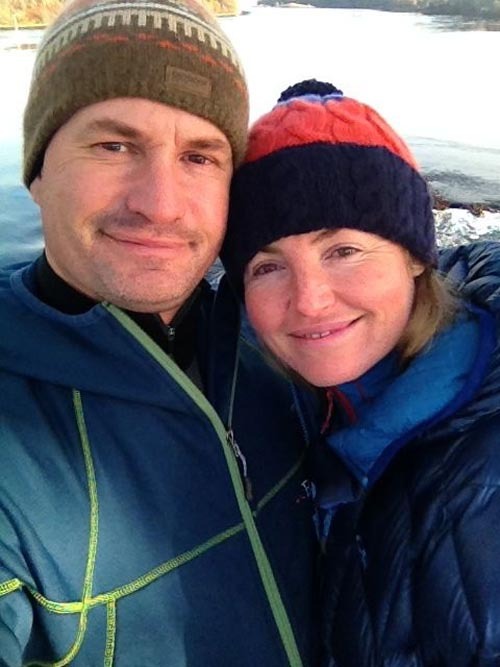 We settled into Strumhor, a bed and breakfast owned by local kayaker Tony Hammock and his wife Olga. Their place overlooks the Falls of Lora, and we spent two nights there taking care of final preparations for the event. The day the event started we headed to the event’s headquarters, the Kilbowie Outdoor Centre, which proved to be a fantastic venue. We had everything we needed, including a boat ramp, dorm style rooms, numerous rooms to meet with groups for indoor activities and even a drying room for our wet gear. The staff was wonderful, and they did a great job keeping us well fed and taken care of while we were there. A peaceful view of the Falls of Lora, taken from the conservatory at the Strumhor B&B. 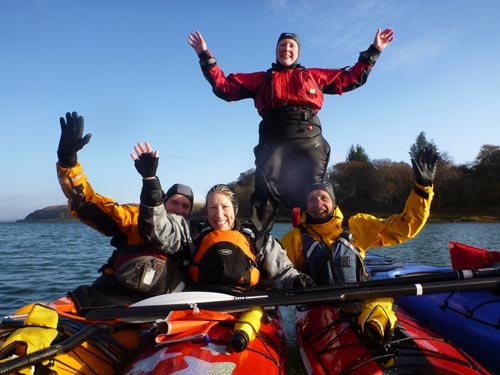 Sea Kayak Oban was very welcoming. Numerous classes ran throughout the three-day event, which had 70 participants and 15 coaches. 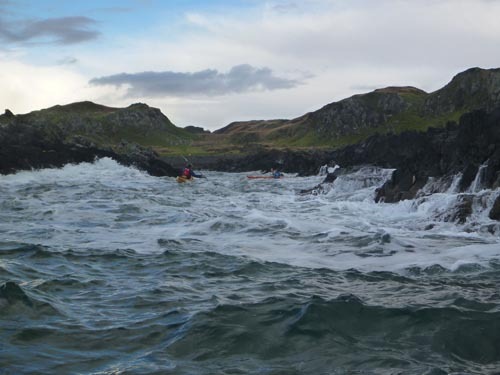 Weather conditions varied from mild to wild throughout the three-day main event and six-day BCU Week which followed. 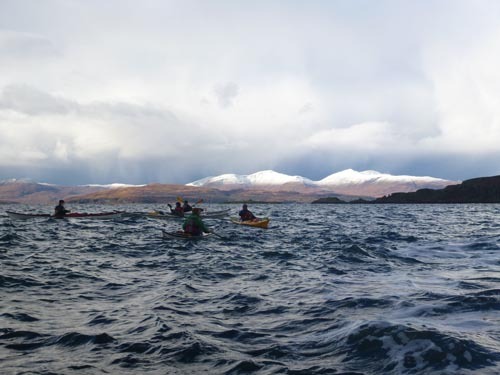 Snow covered mountains and dramatic skies add to a day on the water. 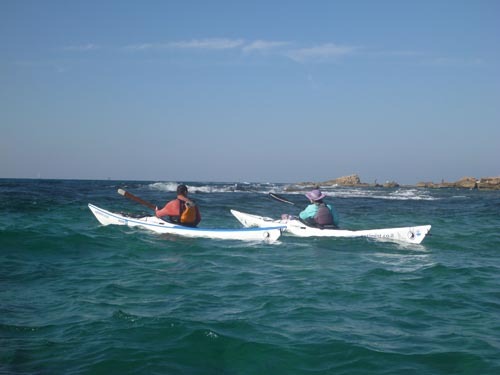 There were lots of islands to paddle around. During the Storm Gathering I ran Yoga for Paddlers each morning, which grew in popularity so much that once the room was full people were participating in the hallway. 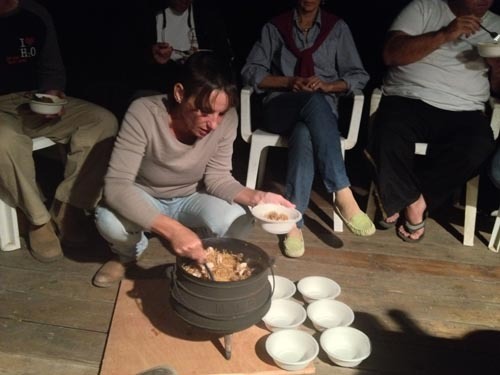 I also taught Fun, Balance Games and Rolling and Greenland Techniques and Traditions. 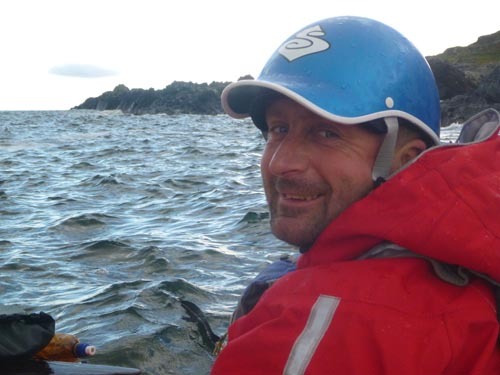 Mark taught 4 to 5 Star Leadership, Moderate Water Boat Handling and 3 to 4 Star Leadership. 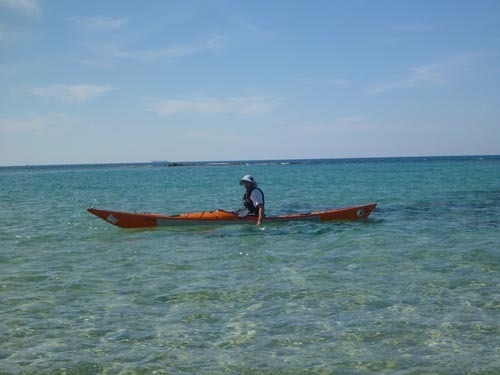 Coach Jim Krawiecki (Jimski), enjoys a day on the water. 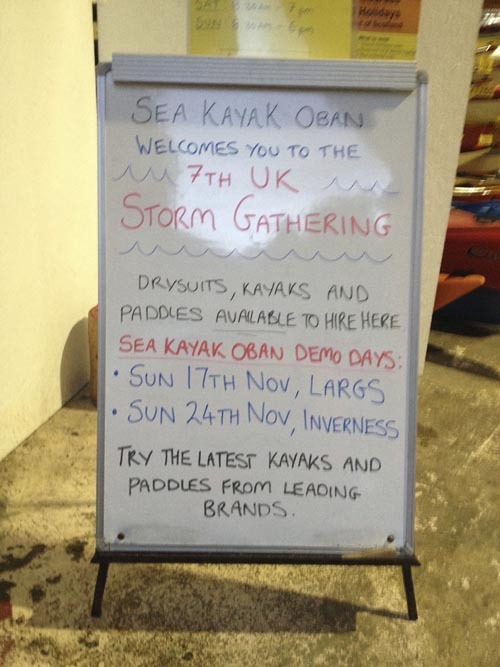 Sea Kayak Oban was the official event retailer, and Stuart Wagstaff and his staff were extremely accommodating and provided us with classroom space for both yoga and BCU Week programs in the days that followed the main event. 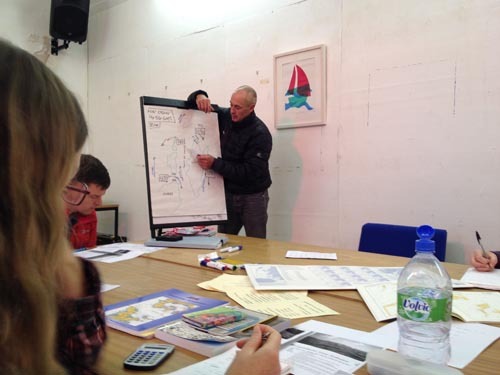 During BCU Week I took Nick Cunliffe’s Open Water Navigation and Tidal Planning class. Nick did a fantastic job of presenting the somewhat confusing material in a clear and interesting manner. 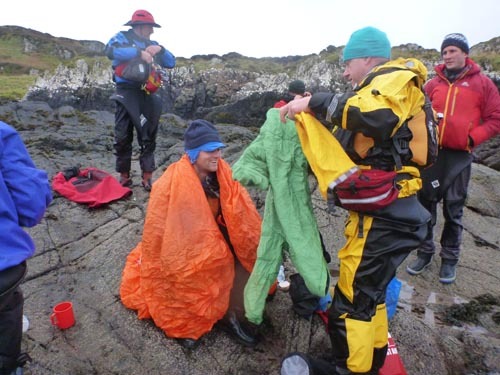 The following day Mark and Nick ran a BCU 5 Star Sea Training, and later that week Mark and I ran a Qajaq Immersion Day in conditions that were appropriately chilly to say the least. 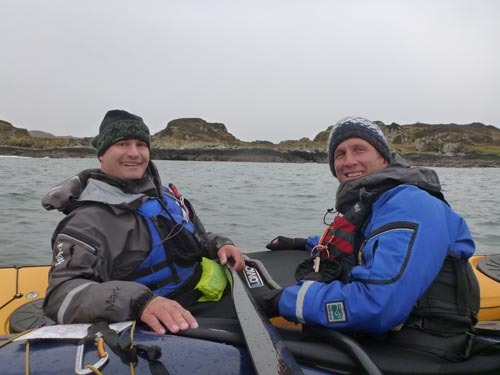 While Mark was running a BCU 4 Star Sea Assessment, I tagged along with his co-assessor, James Stevenson of Adventure Elements. 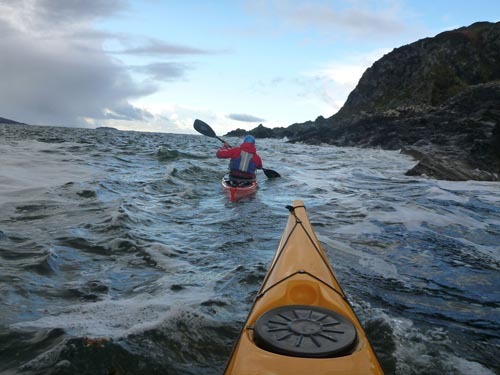 It was great to be led by the candidates and to get to see some more of Scotland’s incredible watery landscape. Rock gardening was a part of many of the classes. 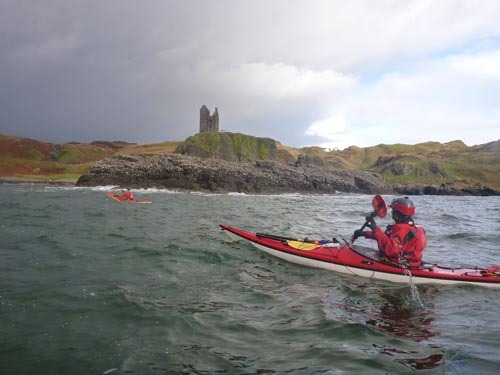 Paddling past castles was a given. Smiles were a common sight. The game room at the Kilbowie Outdoor Center served as both a yoga studio and an indoor classroom. Some classes ran after sunset. Nick talks about crossings in tidal environments. James meets with the BCU 4 Star candidates. 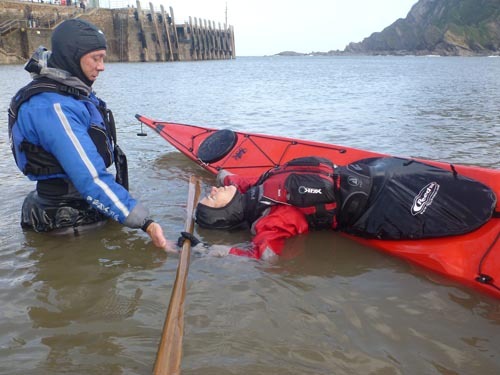 Candidates were presented with the challenge of a hypothermic paddler. After months of organizing this event, I think that Mark and I were a little relieved once it was over with no major incidences. We decided to stick around for a few extra days to relax and enjoy the surroundings. During those days winter seemed to arrive bringing with it a thin layer of snow. We spent our extra time there walking in the town, tasting local food and sampling Scotland’s famous whiskeys. 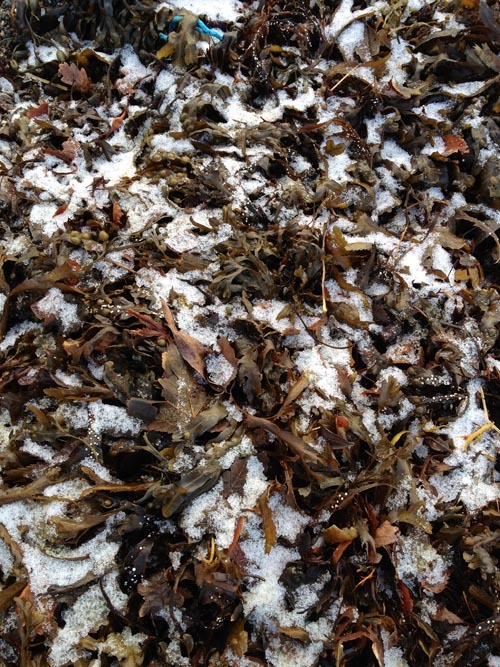 A mix of snow and seaweed cover the beach. 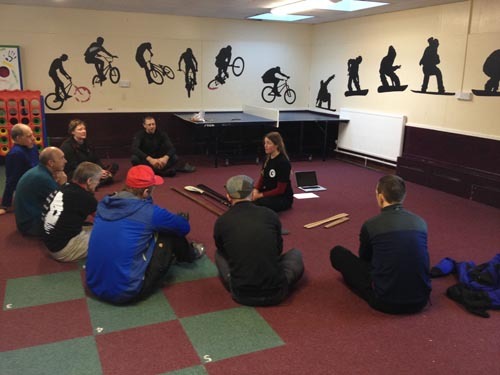 Thanks to everyone that made this event so successful; the staff at the Kilbowie Centre, Sea Kayak Oban, the fantastic coaches that came out to share their knowledge and mostly to the participants. Without you there wouldn’t have been an event. Mark and I enjoy a timeout at the Falls of Lora after the event. So what’s in store for the future of the Storm Gathering? We’re already in the early planning stages for a US event, the US Storm Gathering, taking place next winter in Trinidad, California. 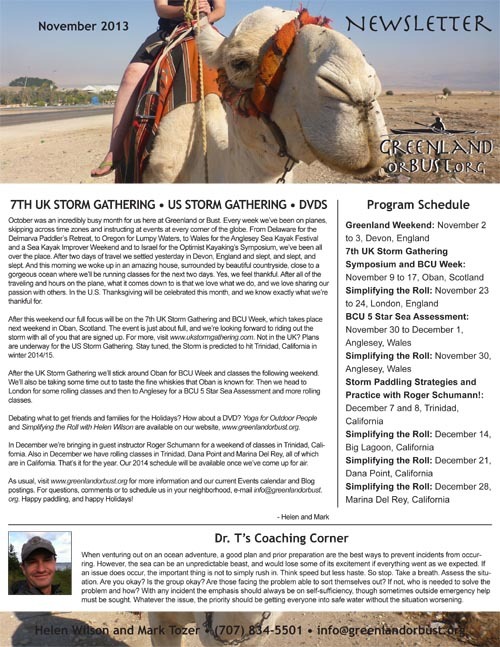 And keeping with the every other year tradition, the UK Storm Gathering will return in Fall, 2015. 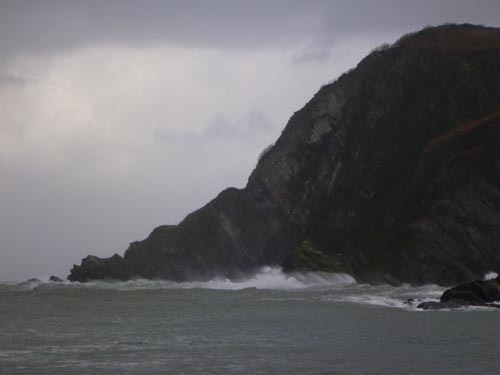 Where you may ask… we’re thinking Devon, England, but that storm is still brewing. Early this month I hopped on a plane for the journey across the Atlantic to England. 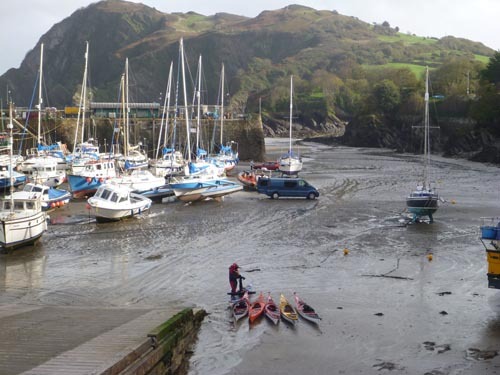 Mark and I met up and headed south, to Devon, England, where we’d be running classes through Sea Kayaking South West. Rob, Anita and their wonderful girls made us feel right at home at the self catering accommodation that they run, Dyers Farm. Dyers Farm is a 400-year-old longhouse, and it is incredible! If you find yourself in southern England, it’s worth a visit. Upon arrival I was exhausted (traveling on a plane for two days can do that to you). I was in a half daze while Mark and Rob discussed the venue for our classes that weekend. I heard them talking about winds of 17 miles per hour and was wondering what all the concern was about. As it turns out, I misheard, and winds were gusting to 70 miles per hour throughout the weekend. Upon our arrival at the beach, the Harbor Master approached and said, “You can’t be serious.” The weather made the classes interesting to say the least, but everyone was a trooper, and our somewhat creative venue worked out well. When the beach looks like this, it’s time to get creative. Tides in England can be more extreme than what I’m used to in California. 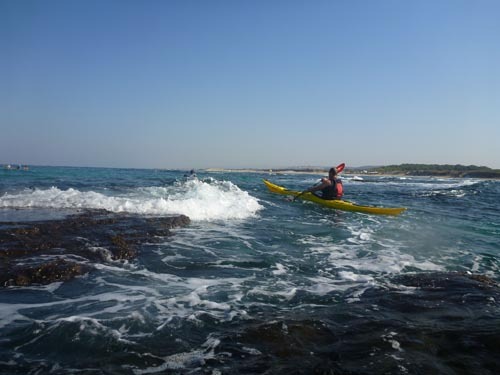 The local paddlers assured me that water would arrive soon. The Balance Brace is the foundation to any layback roll. 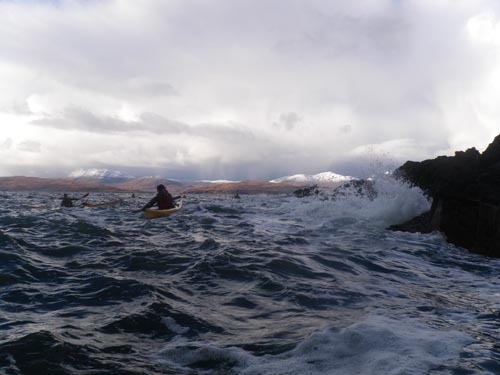 Throughout the weekend we talked about Greenland kayaks and paddles and worked on rolls in both flat water and waves. We also covered re-enter and rolls in both flat and bumpy water. 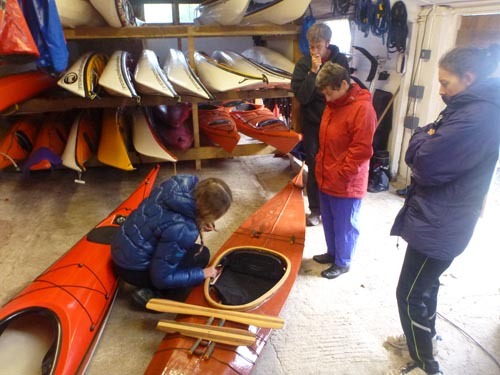 We brought the class indoors to talk about skin-on-frame kayaks and Greenland paddles. 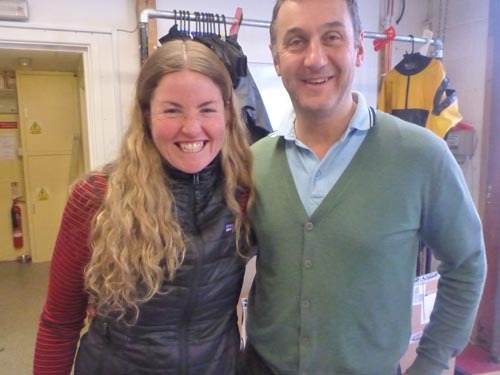 On our way out of town, we went to Reed Chillcheater to meet up with Chris Reed and Reed’s enthusiastic staff. We got a tour of the facility and chatted with Chris about his products. He hooked us up with some fantastic new gear, and we’re happy to announce that we’re now a Reed dealer. That’s right, you can order Reed gear directly from us. 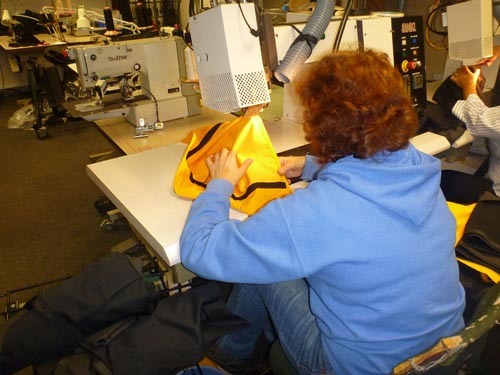 We’ve got Aquatherm Fleece Hoods available for direct purchase, and starting next weekend we’ll have Reed Tuiliqs available for demo during our classes. If you aren’t familiar with Reed Chillcheater, check out them out by clicking HERE. Everyone at Reed made us feel very welcome. 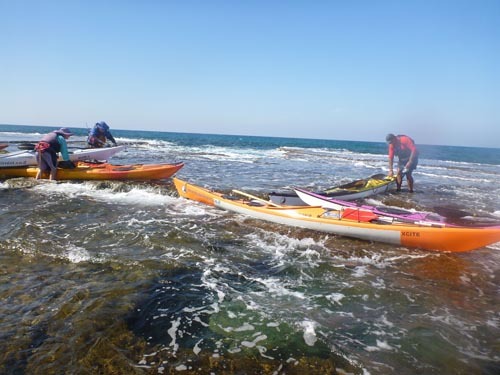 It was fun to watch the formation of paddling gear. Chris shows us some of his latest products. Thanks Chris for the tour. It was great to meet you! For many of us, summer days of bathing suits and sun hats is over for the season. 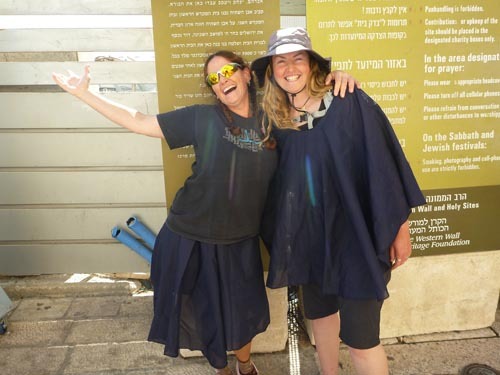 Our shorts have been stashed away for a couple of months, and rain boots and sweatshirts have become a part of our daily attire… but not in Israel. 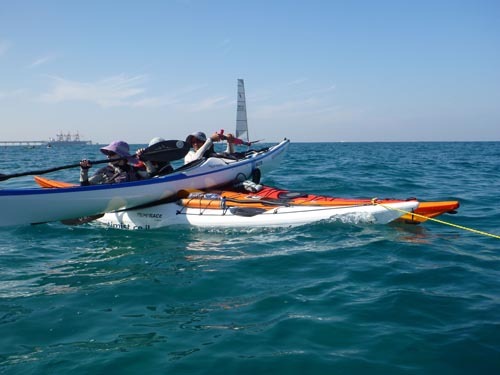 Kayaking season is still in full force, and this year’s Optimist Kayaking’s Symposium was full. Mark, Ben Lawry and myself were this year’s guest coaches and we were thrilled to be there. 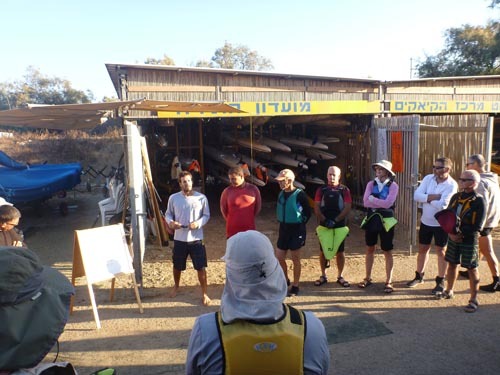 Participants gather at the Club every morning to hear announcements. The Mediterranean Sea has incredibly clear and warm water. 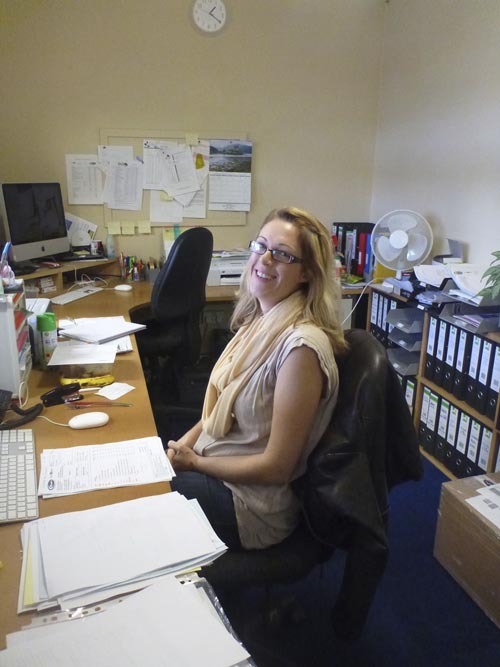 A reef proved to be a great learning environment. The reef created texture for the surrounding water. 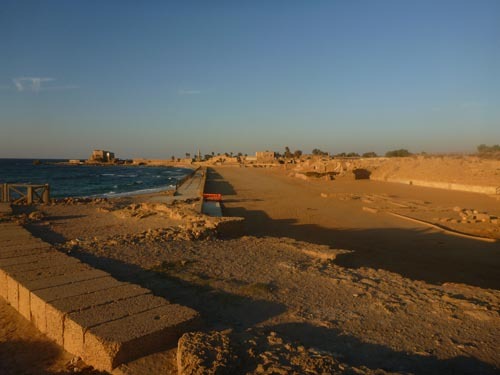 The ancient town Caesarea is very close by. 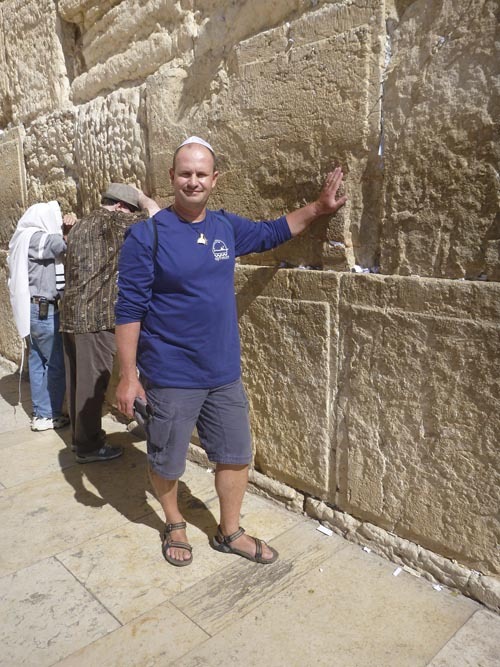 Mark experiences the energy of the Western Wall. 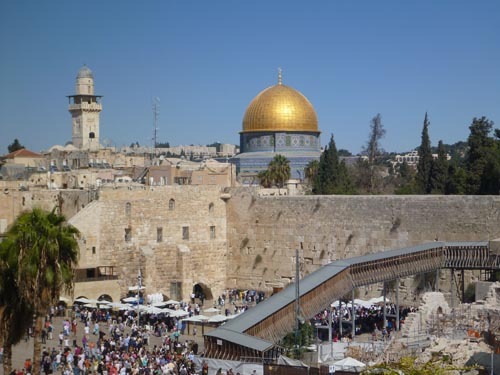 What happens on the other side of the wall is a mystery to those on this side. 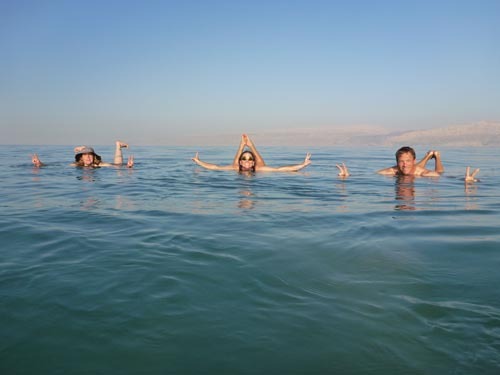 The mud in the Dead Sea is fantastic for the skin.